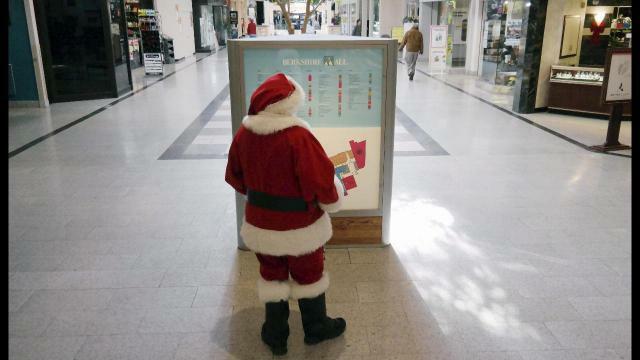 A Montreal shopping mall has been criticized for its decision to trot out Santa Claus about an hour before ceremonies are held on Remembrance Day to honour Canada’s war dead. Saint Nick will be at Place Versailles on Saturday morning — a move described by some social media users as a terrible lack of judgment. Many called on the bearded one’s visit to be rescheduled but the mall responded by saying it isn’t logistically possible to have Santa come another day. His elaborate entrance by helicopter has been promoted for several days. “Rest assured that in no case did we want to ignore the memory of our veterans and all those who made the greatest sacrifices for our country,” the mall wrote in a statement this week. Management apologized in a Facebook post and said it will also mark Remembrance Day in some fashion. Kenneth R. Ouellet, president of the Quebec branch of the Royal Canadian Legion, described the mall’s decision to welcome Santa on Saturday as “regrettable” and said it is likely to offend veterans. “We can’t do anything (to change) it, but there should be more education put out there as to the importance of the day and the hour and the why,” he said in a phone interview. Ouellet said the mall should try to delay Santa’s arrival until the 11 a.m. Remembrance Day ceremonies conclude. In the future, he’d also like Quebec to follow the lead of most other Canadian provinces and declare the day a statuory holiday.